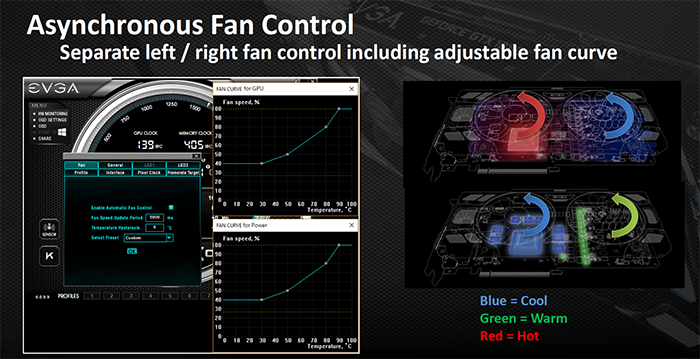 EVGA is today launching a series of high-performance GeForce graphics cards equipped with a new cooling technology. Building on the present ACX range, most GeForce GTX 1060, GTX 1070 and GTX 1080 will also be equipped with iCX cooling. iCX, where the i denotes interactivity, is more than just an incremental upgrade over present cooling, mind, and EVGA took the opportunity of hosting a tech day to explain exactly what's new. Most present cooling, be it EVGA or some other Nvidia AIC, is based off the GPU temperature alone. 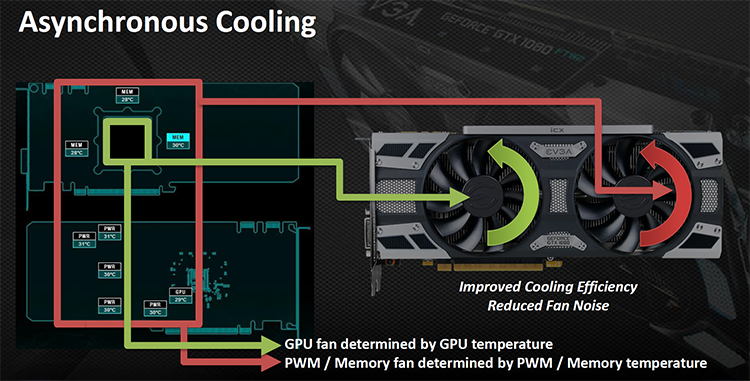 Makes sense, you would think, as the GPU has historically been the warmest part of a card. However, in recent times, particularly with the Pascal architecture, the energy-efficient GPU and improvements in heatsink design mean that keeping a GeForce GTX 1080 relatively cool-ish is fairly straightforward. Indeed, Nvidia has an 83°C temperature target for the GPU and any competent cooler can keep the GPU below this level with the minimum of fuss and noise. According to EVGA, it is the memory and power-regulation components that are often overlooked and the hottest on the card. This is where the new technology comes in. iCX-bearing cards feature nine additional sensors on a revised PCB, split over the memory and power components. Knowing just how hot these other parts are running is somewhat interesting in and of itself, especially to enthusiasts. The pragmatic result of this reporting, via a couple of MCUs, is the ability to run the card's two fans at different speeds, based on information gleaned from the GPU and memory/power. The PCB remains the same size but, as alluded to above, is different from its predecessor. One direct result of this redesign is that certain waterblocks may not work with it - we will know exactly which ones don't fit in due course. Back on track, though the fans are identical to their ACX counterparts, the GPU's temperature controls the left-hand fan speed while memory/power information dictates the right-hand one. What's important here is that the fans run asynchronously - at different speeds - to help keep the card, we guess, in balance. The ability to run at different speeds means that, now, there are two fan headers on the board. EVGA sets a maximum temperature of 78°C for either the memory or power components, with Precision XOC controlling the fan speed accordingly. This setting, for the time being, is not adjustable. iCX also includes a thermal display system on the side of the card. RGB lights highlight the status of the GPU (G), power (P) and memory (M), with the colour of the lighting indicating a range of temperatures - these can be set to the user's definition in Precision XOC. Any changes made to the settings are saved in the firmware, meaning they're intact if the card is moved to a different PC. As an aside, EVGA says that having additional sensors at production enables it to keep a weather eye on any potential faults during card assembly. 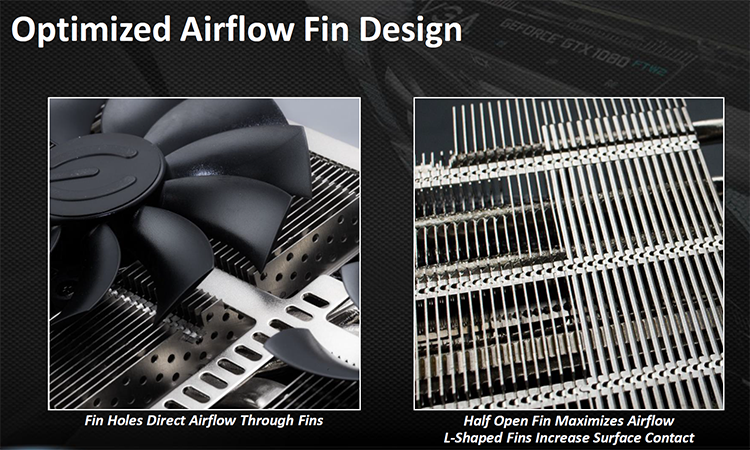 Having additional reporting and asynchronous fans is a step in the right direction, though EVGA has also used this opportunity to improve the heatsink design. Specifically, the base and backplate are now die-cast and far more substantial than before, acting as what look like proper heatsinks more than the cosmetic, card-strengthening purpose of the rear of the ACX. To this point, the baseplate has pin fins that increase the surface area, while the heatsink itself, ostensibly the same, uses fin holes for more even airflow and L-shaped fins to increase the surface area further.